The Ultimate Body Press Pull Up Bar is the perfect addition to every home gym. 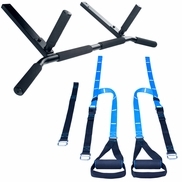 Featuring extension bars for a range of door frames, sturdy solid steel construction, additional padding for push up stand use, and comfortable thick foam grips, the Ultimate Body Press pull up bar supports your best fitness everyday. Adding a pull up bar to your living space brings home the single best bodyweight exercise you can do - the pull up. Engaging groups of muscles across your upper body and down the chain through your abdominals builds lean muscle and spikes your metabolism for rapid progress on the results you want most. Rapidly sculpt arms, chest, and core. Change your whole pull-up bar workout by adding our Push Up Rings Accessory. Adding Push Up Rings will diversify your workouts with exercises like ring dips, body weight rows, one arm rows, torso twists, modified pull ups, assisted one leg squats and more. Push Up Rings let you set your own resistance to each exercise ensuring full scaled set and full workouts every time. 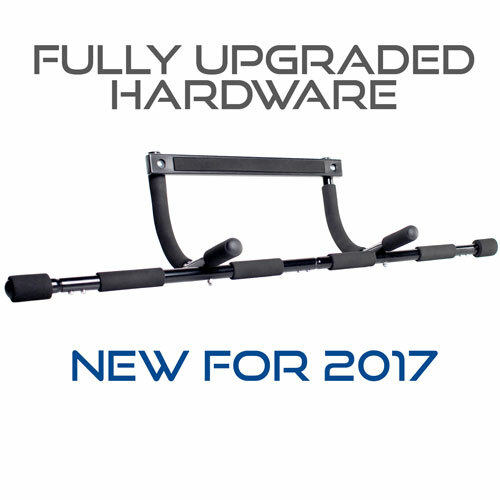 Purchase the Ultimate Body Press Pull Up Bar or the Pull Up Bar Package and if you are not completely satisfied, you can send it back within 30 days for a Full Refund including Shipping and Handling. -Fits doorways 24 to 36 inches wide with molding up to 3.5 inches wide. -Supports up to 250 pounds. Adjustable Width Doorway Pull Up Bar5DougAugust 20, 2014This was easy to put together for me and I'm not very handy. Also, this is much cheaper than using weights. I use this all the time for pullups, pushups, triceps, etc. Throw in some weights for curls and you have a full upper body workout. It only fit in one of my doorways but that's good enough for me. You don't need an entire gym to get a decent workout. Just need to use some basic body weight. Adjustable Width Doorway Pull Up Bar5Chris RFebruary 4, 2014extremely easy to set up. great work out easily and often. I find it more effective than when I was wasting hours at the gym. Was concerned since my doorway is bordered closely to an adjacent wall but it fit! Adjustable Width Doorway Pull Up Bar5hannahJanuary 14, 2011wow! I'm impressed with the pullup bar! It's super easy to put together (my husband didn't think I could do it lol) and I love being able to use it whenever! Adjustable Width Doorway Pull Up Bar5jjjDecember 2, 2010AWESOME!!!!!!! Adjustable Width Doorway Pull Up Bar5morganAugust 8, 2010The pull up bar works great. Thanks again for a speedy, safe and simple transaction. Adjustable Width Doorway Pull Up Bar4TomJuly 7, 2010I received the pull up bar and put it together. All in all it is a very solid unit, priced right, and does have a wide range of uses. After using it for awhile I noticed that I couldn't do any really wide pull ups. It is safe to use in doorways with no damage to them. Thanks. Adjustable Width Doorway Pull Up Bar5VladJuly 6, 2010I have only used it for a relatively short time, but so far so good. Assembly was a breeze (5 mins) and everything seems to just work out of the box. Adjustable Width Doorway Pull Up Bar5lynettJune 15, 2010Easy to put together, strong and it doesn't give your hands calluses, so no gloves are necessary. I love it and i use it almost everytime i workout. Adjustable Width Doorway Pull Up Bar5Rudolf masopustJune 10, 2010It is very very good !! Fabulous. I am very happy with Pull-up Bar. Thank you !! Adjustable Width Doorway Pull Up Bar5HeatherMay 24, 2010This is perfect for our situation living in an apartment. It easily holds my 115lb frame, as well as my husband's 180lb frame, and hasn't done any damage to the door frame. We just make sure to check it by pulling downward each time we are going to use it. I also use the rounded part for push-ups sometimes. Adjustable Width Doorway Pull Up Bar5Audrey MCMay 19, 2010Love the pull-up bar, i use it alot to do Zuzana's workouts, and it holds perfectly on many door sizes etc.. its great!! Adjustable Width Doorway Pull Up Bar5MelinaApril 24, 2010What else can I say? This thing is awesome. Easy to assemble even for the ladies and comes with a little wrench and screw driver. Perfectly portable and sturdy. 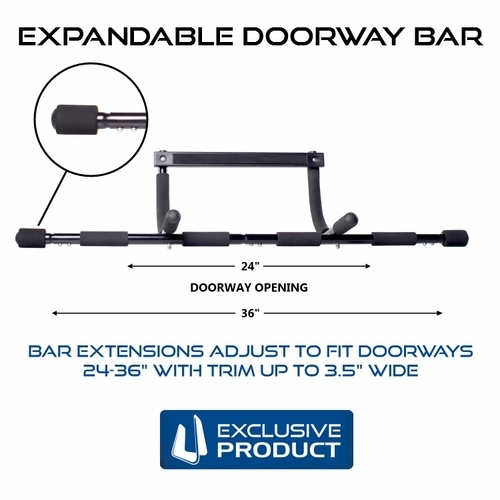 Adjustable Width Doorway Pull Up Bar4CarlApril 6, 2010I've used this product with the P90X system. Very good product. Word of advice though, make sure you have a doorway without a door on it to use it. Answer: Yes, the pull up bar hangs from the door frame. Question: How much does the package the pullup bar is sent in weigh? and what is the size of the package? length & width.. Need to know because of shipping possibilites from USA to Norway.. Question: Does this require any brackets permenently attached to the wall above the door frame in order for it to hang from the door frame? 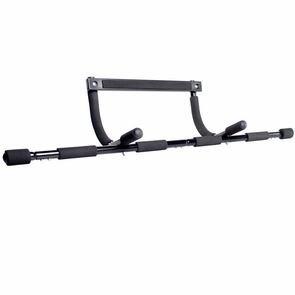 Answer: The UBP Doorway Pull Up Bar does not require and brackets be permenently attached to the wall. Question: Does the doorway NEED to have moulding? What's the minimum depth of molding that will work? How can I know this is safe for me, and my door? And, when is it back in stock? Answer: There must be molding. It must be at least 1/2 inch. The pull up bar is designed for doorways that are 24-36 inches wide with 1/2 thick molding that is no greater than 3.5 inches wide. If you get the bar and it does not work you can send it back for a full refund. Question: I was just wondering how it clips to the door frame without breaking it. Answer: The pull up bar transfers the downward force of your body weight laterally into the strongest part of the door. 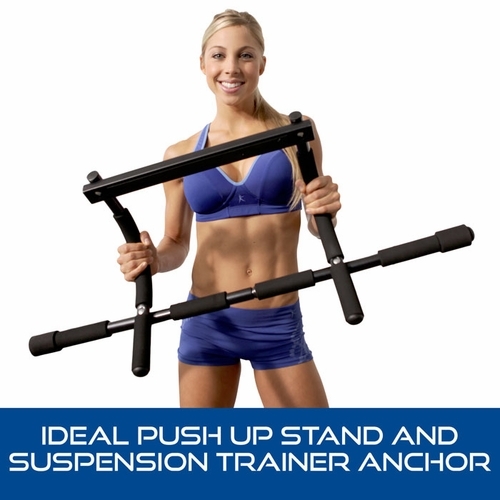 Question: It says suspension system and push up stand sold separately. Are either of these needed for installation? Answer: No. The other items are accessories that are sold seperately. Question: Hi, if I purchase this item with the jumping rope, how much is shipping to zipcode 18105 0r 18102? Thanks in advance! Answer: To find accurate shipping rates please add the items you wish to purchase to the shopping cart then click "Proceed to Checkout". Enter your address, choose your shipping method and click "Apply". Question: What is the bar made of (Eg: plastic, aluminum, steel)? Question: Hello. Must you have a door frame to use the doorway pull up bar? My doors are not framed with the traditional molding around them. Answer: The Doorway Pull Up Bar requires trim. Question: DO I HAVE TO TAKE A DOOR OFF TO USE THIS? sOMEONE COMMENTED IN THE REVIEWS THAT YOU NEED A DOORWAY WITH NO DOOR-I ASSUMED YOU CAN USE IT ON THE OTHER SIDE OF THE DOOR. Answer: You do not have to take the door off. Question: If i have a door on my door frame how am i to clamp the pull up bar?? Answer: The plastic bar rests on top of the door trim on the side the door opens to. The long metal pull up bar rests on the other side. Question: My husband is afraid he will rip the molding off of our door if he uses this. Is the pressure on the molding that the flat piece is hanging on or on the sides that the bar is pressing against? Answer: The pull up bar is design to transfer the downward force your weight laterally into the strongest part of the door. Answer: Our products are not available on QVC. Answer: The door width must be between 24-36 inches. Question: Does this bar require that screws be used to hold it in place? What holds this bar in place? Answer: The bar requires no screws to hold it in place. Question: I was trying to order the doorway pull up bar. It says that it will be back in stock June 20th. I was wondering if the $29.95 price will continue until it returns in stock? Answer: It is now available. Please try again. Question: Can I order replacement grips for my pullup bar? Question: My door frame measures 35" from outside molding to molding and the inside measures 30". Is this enough room for the pull up bar? and What are the dimensions on the bar itself? Answer: You door had the correct dimensions. Question: Will it fit all size door frame? Can you have it ship to Hong Kong? Question: Do you need an rxtra heavy doorsill? Answer: No. This pull up bar will work with any door trim under 3.5 inches wide. Question: Does this product work if the width of the door is 36inches. The molding around the edges is about 2.5-3in. Will this product work? I have already bought 2 systems that said they work for 36 in but they don't. Answer: This pull up bar will work because it comes with extensions that make the pull up bar 42 inches long. Please look under the Specifications tab for a link to the instruction manual to find a illustration of this. Also note that the doorway in the video is 36 inches wide. Question: Is there a weight limit for using this? I am now about 240 pounds. I don't want to bend or break the equipment. Question: What is the max width doorway it will work on with extensions? Question: Will this product work in a mobile home doorway? Thanks! Answer: This pull up bar fits doorways 24 to 36 inches wide with molding up to 3.5 inches wide. Question: The various reviews on the Web for many door-mounted pull-up bars mention damage to the door frame. Can you tell me how I can prevent damage if I select this product? Thank you. Answer: Not all users experience any damage. If there is any it is usually limited to some discoloration above or on the door trim which can easily be cleaned off with warm soapy water and a wash cloth. Damage is more likely for user who weigh more than 185 lbs and advanced users. If used for moderate workouts 3-5 times a week you should not have a problem. Question: I'm 5'0" , would this reach down far enough for me to grab it? Question: How do you install the doorway pullup bar? Answer: Please watch the video on the item page for instructions. Question: Is there enough room at the top to fit your feet in there for ab workouts? Question: Is there free shipping? Answer: No. To find accurate shipping rates please add the items you wish to purchase to the shopping cart then click "Proceed to Checkout". Enter your address, choose your shipping method and click "Apply". Question: Will it work on wood door frame? Question: who manufactured this and where? Answer: The is manufactured by Ultimate Body Press in China. Question: Will the entire bar fit within a 36 inch door frame? Answer: This pull up bar will mount to a 36 inch door frame. Question: I want to use this in a doorway with a 36 inch door opening. The written specifications indicate it will accommodate a 32 in door but the video says that with the extensions it will fit a 36 inch door opening. Please let me know if that is true and whether it will fit in my doorway. Question: Is this item adjustable? Answer: Yes, please see the instruction manual listed in the "Specifications" tab. Question: I am 6ft 2 in 215 lbs - will this handle ok? Answer: It is 2 inches thick and it is made of plastic. Question: What is the largest door this will fit? Answer: Fits doorways 24 to 32 inches wide with molding up to 3.5 inches wide. Question: do you have to screw it into the door frame? Answer: This pull up bar does not have to be screwed to the door frame. Question: I see the pull-up bar rests on the molding on the top of the door. Are there are any maximum measurements for that molding (e.g., height or width)? Question: I tried another bar and it did not fit my door. I'm worried your bar is not going to fit. how can I be sure it will fit my door? Question: Can you hang upside down on the bar and do inverted crunches. Answer: We do not recommend hanging upside down from this product. Question: Would I be able to attach a suspension trainer to this and use the suspension trainer safely? It would mean that the pull-up bar will get pulled in other directions than just straight down, including at 45 degrees. Question: Is there enough clearance to use this product with inversion/gravity boots? Answer: We do not recommend that you use gravity boots with a doorway pull up bar. Question: does the top of the door frame need reenforced ? Answer: No, the design of the pull up bar redirects the downward force of your body-weight laterally into the door frame. Question: Can I purchase additional foam grips for this? One of mine is torn. Question: it says it is 24~36 inches with molding up to 3.5 inches wide. does it mean it stretches up to 39.5 inches? because my door is 40 inches wide and 36-inch pull-up bar wouldn't work. Answer: With the extensions added this pull up bar is 42 inches wide. 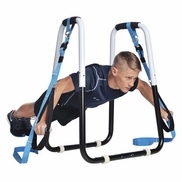 Question: Would this product be even sturdier if the horizontal bar was attached on top of the curved bars instead of below them (as in the instructions)? Answer: Mounting the bar above the curved bar would not substantially improve over all strength. Question: how wide is the pull-up bar without any of the extensions attached? 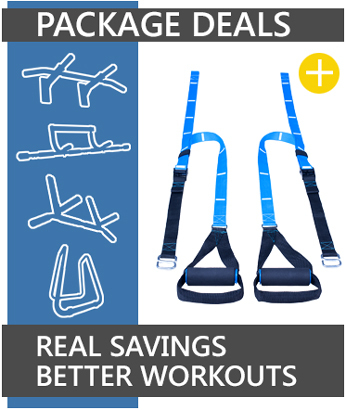 Combine the Joist Mount Pull Up Bar and Bodyweight Resistance Trainer for instant package savings. Workout better, satisfaction is guaranteed. 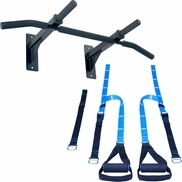 Dip Bar Fitness Station and Bodyweight Resistance Trainer Package adds effective exercises to Dip Station and Pull Up Bar workouts. 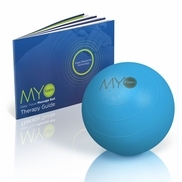 Eliminate trigger points and regain full strength in your largest muscles with the 5" Myofoam Mobility Ball. © 2008-19 Ultimate Body Press. All rights reserved.